The system SS Leporis is seen here, over time, in the sharpest images ever obtained. Astronomers have combined four Very Large Telescope Interferometers (VLTI) at the European Southern Observatory's (ESO) Paranal Observatory to obtain the sharpest-ever images of the star system SS Leporis, which contains two stars, one of which is cannibalizing the other. The two stars in SS Leporis, in the constellation Lepus, orbit around one another over a period of 260 days. The stars are relatively close together, separated by slightly more than the distance between the Sun and the Earth. Because of their proximity to one another, the hotter of the two - the vampire star - has absorbed about half the mass of the other star. 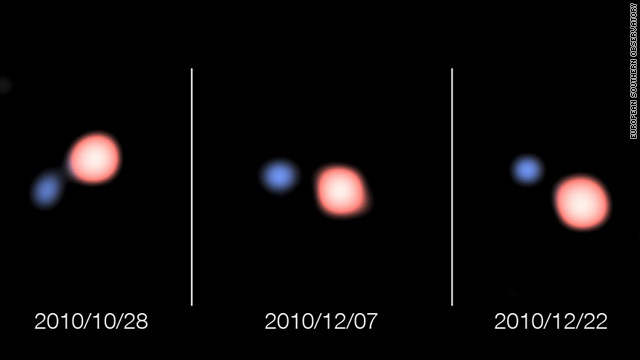 The new observations show that the companion star, which is a cooler red giant, is smaller than previously thought. This has led the astronomers to revise their initial model of how the red giant lost matter to the vampire star: instead of matter streaming from one star to the other, the astronomers now think that the red giant must be expelling matter as a stellar wind, which then gets captured by the vampire star. @brendon coss: I believe it was a "Twilight" reference. what do mean? The matter on the stellar wind sparkels? Anyone cracking jokes about "But does it sparkle" gets smacked on the knuckles.